I have to thank Andy for visiting me at the studio this weekend. He’d travelled up from Devon for a day of shooting and a few beers later on. 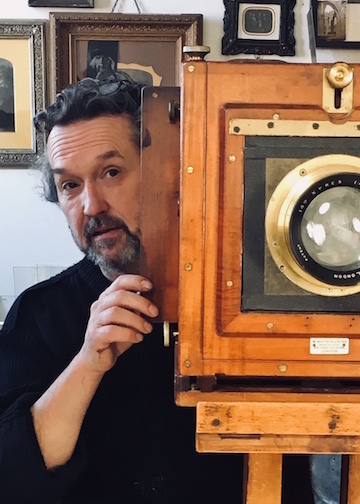 I wasn’t sure what we were going to get up to but he suggested having a mess around with some wet plate negatives, seeing what we could get up to with the chems we had available. I’ve known Andy for a few years now and appreciate his openness and laid back enthusiasm when it comes to photography. It’s given me a boost in these cold months and I’m keen to get back in the studio. Especially in addition to seeing the work of Fran Sanchez Montesinos on Facebook, his negatives and prints are well worth a look. Andy at the controls of the Watson & Son studio camera. I don’t shoot wet plate negatives that often, and when I do they tend to be on location and not in the studio. 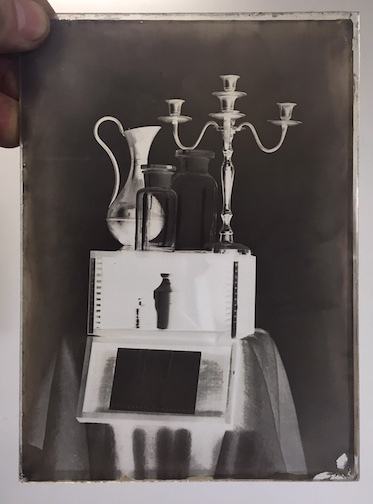 There are two main ways of making a wet plate collodion negative, although it is said you can make a negative straight out of the camera, with the right collodion, developer, lighting and skill and also this must be in addition to when the stars align and you pray to the collodion Gods. I’ve never been so fortunate, so have relied on the popular redevelopment technique. There is also the Intensification technique which I’ve never tried. Both techniques are done following normal processing and washing. 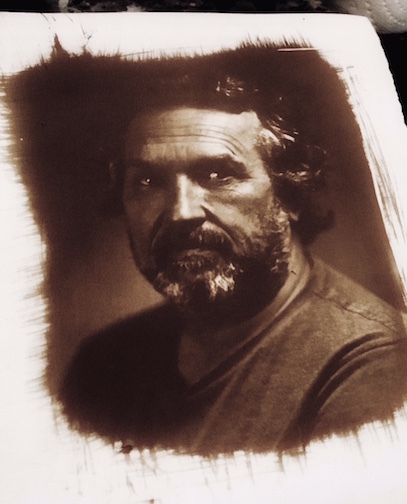 The Intensification technique involves a bleach bath, in this case Copper Sulphate and Potassium Bromide, this turn the image a lovely bright pale blue. (We liked the look so left one at that stage to see what happens). 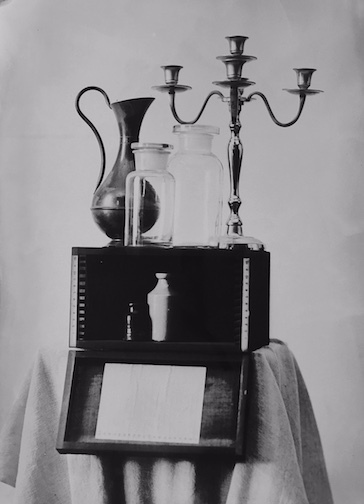 Its then washed briefly before being immersed in a weak bath of Silver Nitrate and Nitric Acid, we didn’t have Nitric acid so omitted it and reduced the Silver concentration. Bang its done. Its not subtle but if you like a good contrasty neg it’ll do. Ours had some strange striations probably from the wash, either too much or not enough. 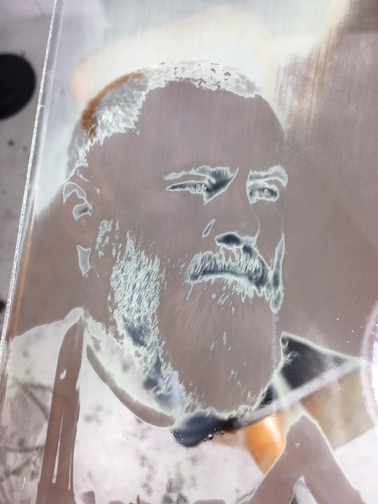 A copper intensified negative (looks denser in hand). The Redeveloped technique involves an iodine treatment, now most info says a solution the colour of red wine or tequila? Now thats quite a difference. So we guessed. The plate is coated with the iodine until there is a change in colour, then washed, exposed to UV again and then redeveloped with a combination of Pyro dev with a few drops of silver nitrate, this is repeated to build density. Its the preferred method and more controllable. 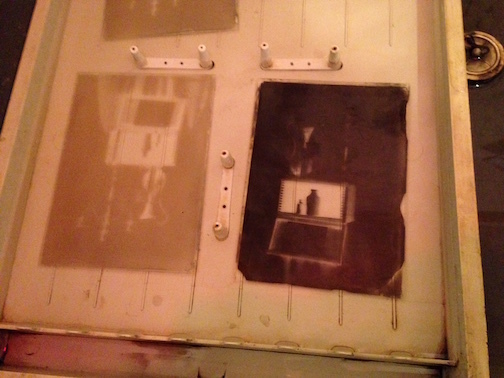 An extended redeveloped negative using iodine and then pyro/silver dev. A quick digital inversion, obviously we hadn’t concentrated too much on content and composition but it would do. Some plates in the wash. Here you can see the difference in density of an out of camera neg and an intensified neg. The intensified neg is high in contrast. We had some funny goings on with a handful of the redeveloped negatives. On application of the iodine it seemed only parts of the plate showed any changes. One would work just fine and then the next would not. Frustrating but interesting. Email conversations with Mark Osterman suggest insufficient wash times between fix and iodine. Thanks Mark. Still makes for a freaky image! 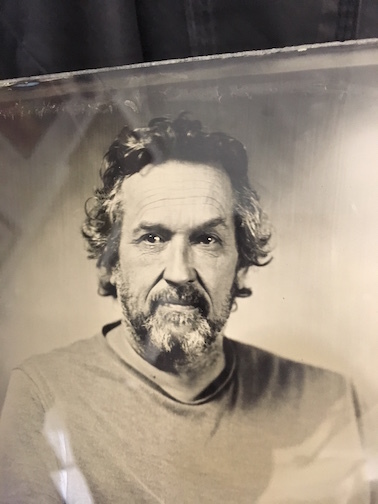 A quick van dyke print from one of the dodgy negatives that only partly redeveloped, there was a strong demarcation line between the hair and the forehead, luckily it doesn’t show too bad in the print. We were also interested in using the same negative developer to make positives, instead of reverting back to a positive developer. This is something I did for a while a few years ago, especially for the Limehouse Golem plates. In theory you would expect a greater tonal range because of the restrained longer dev times, there must be a reason people do not do this. Granted using positive developer does give greater contrast but then it would wouldn’t it? Here’s a PosNeg, a positive from negative developer. Madness. Think I need to revisit that! 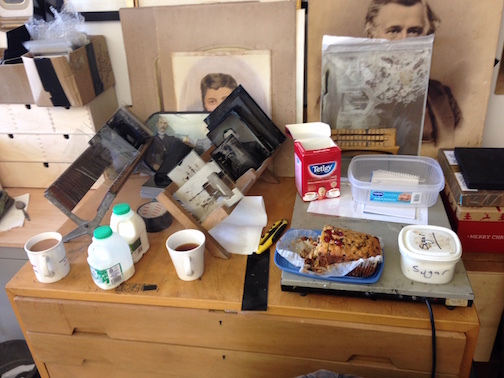 All this was helped along with a few slices of Helens fruit cake. Thank you Helen, as tasty as ever. Thanks again Andy, was great to see you and shoot some plates. And remind me we need to follow up our Phoenix conversation with Patrick. 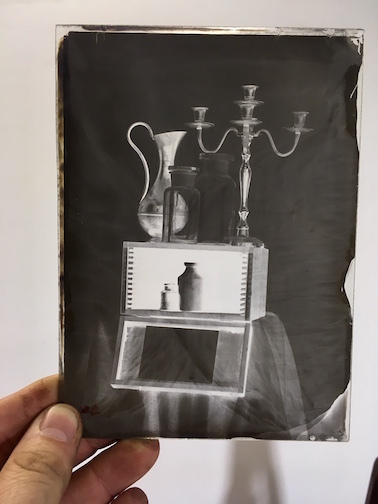 26 Feb This entry was written by Fourtoes, posted on February 26, 2018 at 10:33 PM, filed under Wet Plate..